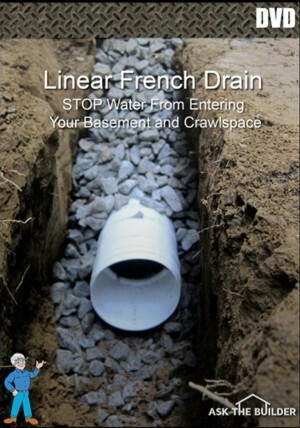 Think of a trench drain as a long gutter in the ground. Just as a gutter at the bottom of a roof captures water and channels it to a downspout, a trench drain does the same thing at the edge of a driveway or a parking lot. You place the trench drain so it captures the overland flow of water. Realize once captured, you have lots of water concentrated at one point coming out of the pipe leading from the trench drain. You can minimize erosion by placing rocks that absorb the water’s energy. This is not an issue if you’re allowed to connect the trench drain to a city storm sewer or an existing drainage channel near your home. I’ve rated this project four hammers out of five because you have to have some math skills, you need to dig - that’s often not easy, and you need to know about concrete and carpentry. Now don’t let the difficulty rating scare you, because you’ll make it through this project with my help. I just wanted to be honest with you. It’s not like running a bead of caulk! Watch the entire video series below unless you’ve come here from YouTube having already watched it. Be sure to look at the RELATED CONTENT links at the bottom of this page. Lots of goodies there for you. Be sure you select a trench drain system that can support the weight of anything that MIGHT drive over it. Hoping car and truck tires stay on the pavement is like hoping for it to rain. You hope for things you can’t control. You can’t control your guests’ cars! Don’t underestimate the amount of water your trench drain will capture. The outlet pipe from the drain probably should be no less than 3 inches; 4 inches is ideal. The trench drain needs to be designed so it captures the water and the water doesn’t flow over or around it. You’d be surprised how many trench drains don’t capture water because they were set too high. Long trench drains can only handle so much water. You may have to install separate trench drains with separate outlet pipes to handle the flow of water in periods of heavy rain. If you’re working with concrete like I did, don’t add too much water. Excess water weakens concrete. Read the instructions on the bags or buckets of blacktop patch. Pay attention to maximum thickness, etc. These products work really well if you follow instructions. Please subscribe to my Newsletter and get insider information on the latest home-improvement tips, and products. I guarantee you that my newsletter WILL save you time and money. Frequently, I include your questions with my answers and proposed solutions. Perhaps the best part of the newsletters are my reviews of new products based on my own testing. Click here to read my past newsletters. Enter Your Name Here: Easy! When you click the Subscribe Now button, a confirmation email is sent to the address you entered. You MUST CLICK ON THE LINK WITHIN THE EMAIL to complete your subscription. Watch for your first Newsletter! Alternative info would be helpful. I need a drain accross the yard and driveway & plan to fill it with rocks. More info on that approach would be appreciated. This single product system seems a little too "Quick Start" All in all I thank you for your efforts. Phil, you need to watch the entire series of videos. Had you done that, you'd have your questions answered!